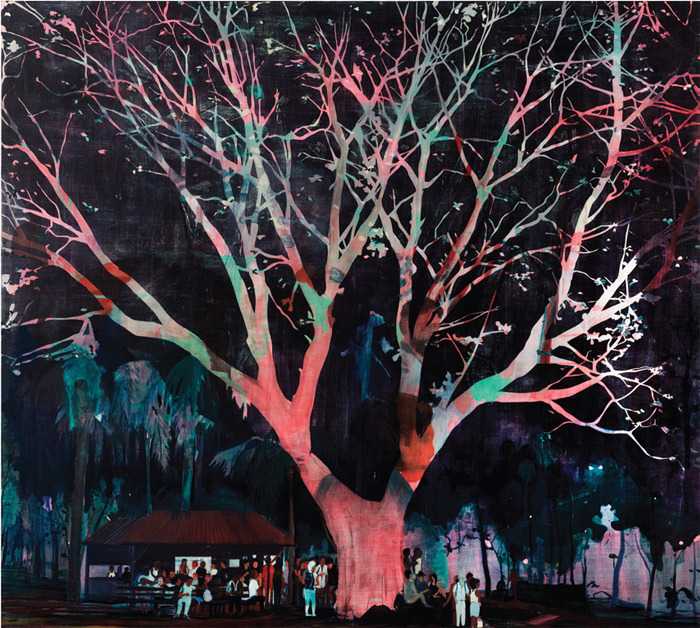 Jules de Balincourt, Waiting Tree, 2012, oil and acrylic on panel, 78 x 87". “Parallel Universe,” Jules de Balincourt’s first solo show at an Italian institution, includes five paintings from 2012, each different in subject and content. That all were painted around the same time helps make it clear that this body of work may be wide-ranging thematically but is consistent in terms of its pictorial syntax. The canvases exhibited in Reggio Emilia echo one another, as if in reciprocal expectation that the painting process will lead to results that, however different, are complementary. Moreover, it seems that the artist has been working to distance himself from daily events and to translate the themes of his paintings on a universal level.